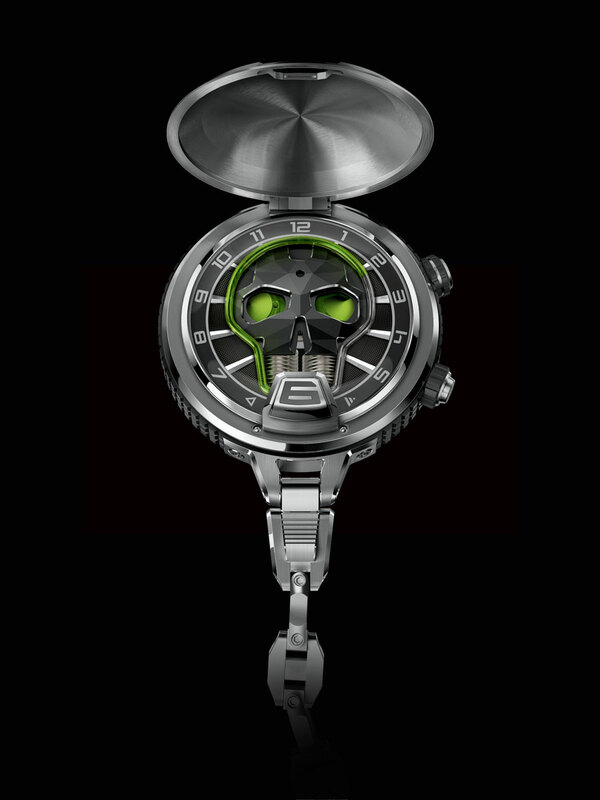 HYT has unveiled its first ever pocket watch, the Skull Pocket. A new case, the first ever Skull and mechanical light source combination, exclusive finishes, and just 8 pieces available: the Skull Pocket marks a turning point in HYT’s development. 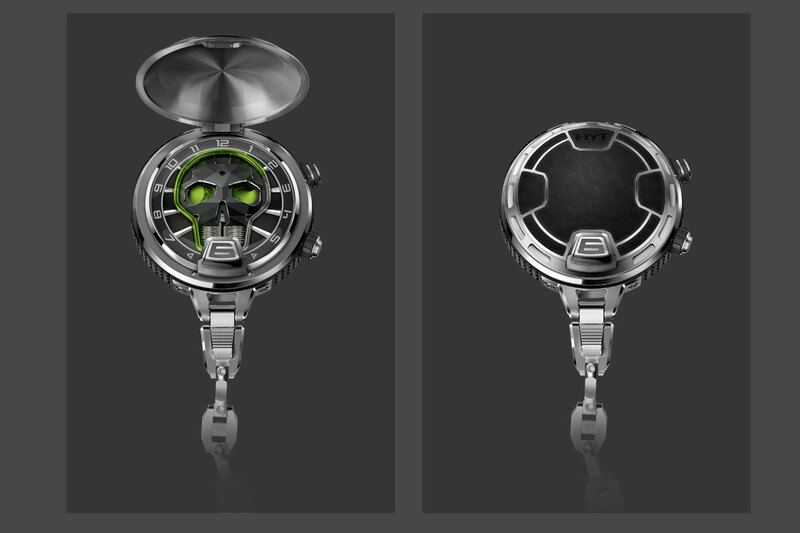 With the Skull Pocket, HYT is restating its desire to invent the watches of tomorrow, using the knowledge of the past and the science of today. The pocket watch, one of the most noble legacies of traditional watchmaking, has become a new playground and means of expression for HYT. It exudes an “art de vivre” which is both contemporary and unconventional, embodied by this rare, interactive piece. The fluid technology integrated in HYT’s Skull Pocket sits perfectly with all the lines of the traditional mechanical watch, bringing these into the 21st century. This ability to take fine watchmaking far beyond its conventional horizons is one of the reasons why HYT has just joined the very exclusive circle of partner brands of the Fondation de la Haute Horlogerie. The Skull Pocket is available in a limited release of 8 pieces. It is one of HYT’s richest creations. For the first time, the light source module developed for its Metropolis model has been combined with a Skull. This module has two LEDs positioned underneath the rider at 6 o’clock. The micro-generator which activates them has been integrated into the case. It works by converting mechanical power into electricity. A barrel spring is loaded when the dedicated push-button crown at 4:30 is turned. Pressing this push-button crown then releases the spring and turns the micro-generator at very high speeds, creating the electricity needed to activate the two LEDs. This bathes the Skull Pocket in a soft blue light, and gives the green liquid its fluorescent glow. The assembly sits within a 59 mm case which was specially created for the Skull Pocket, made from titanium and black DLC titanium. In place of the lugs, HYT has developed an exclusive cover system to protect the dial. Articulated by a hinge at 12 o’clock, it is triggered by the iconic rider at 6 o’clock, which has become one of the brand’s aesthetic hallmarks. The cover features an engraved pattern with leather inserts, and can be fully customised. · micro-generator system triggered by pressing the push-button crown at 4:30.